Eddy Kamuanga Ilunga, 'Oubliez le passe et vous perdez les deux yeux', 2016. Acrylic and oil on canvas, 220 x 200 cm. Image the artist, courtesy of October Gallery. Eddy Kamuanga Ilunga, 'False Memories', 2016. Acrylic and oil on canvas, 200 x 200 cm. Image the artist, courtesy of October Gallery. Exhibition of new works by the exciting young Congolese artist Eddy Kamuanga Ilunga. This will be the artist’s first exhibition at the gallery, and his first solo exhibition in the United Kingdom. October Gallery, London, is pleased to announce its forthcoming exhibition of new works by Eddy Kamuanga Ilunga. This will be the artist’s first exhibition at the gallery, and his first solo exhibition in the United Kingdom. A private view will be held on 29th June. Eddy Kamuanga Ilunga is one of the most exciting young artists working in Africa today. 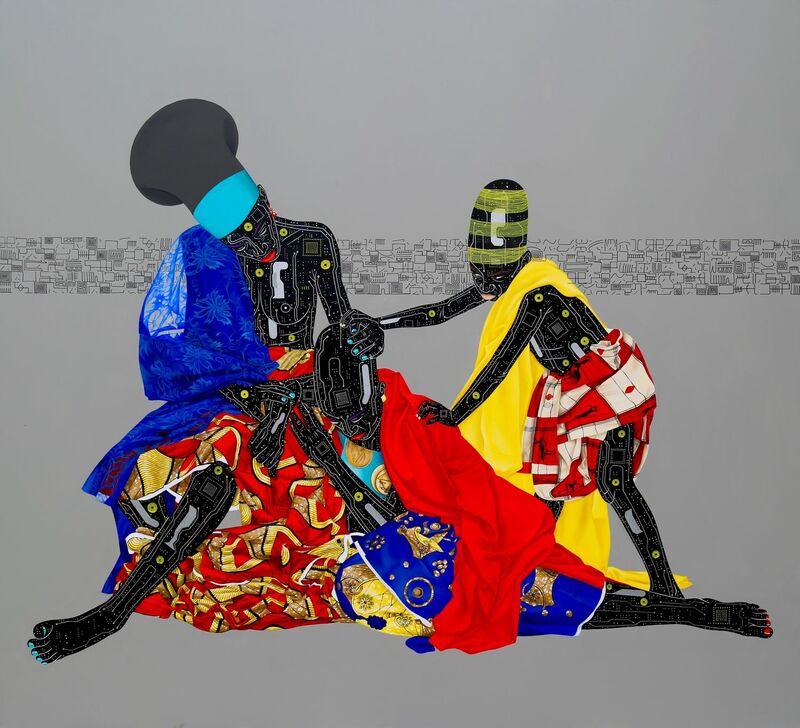 Born in the Democratic Republic of Congo in 1991, he trained at the Kinshasa Academy of Arts and has gone on to found the dynamic Congolese art collective ‘M’Pongo’, representative of the creative vibrancy to be found in modern Kinshasa. In his present series ‘Mangbetu’, Kamuanga Ilunga has explored the predicament of the Mangbetu people, an ethnic group of warrior extraction in the DRC, whose culture is being threatened by a desire to modernise. The DRC is the world’s largest exporter of coltan, a raw material used in computer chips and mobile phones, and Kamuanga Ilunga pays equal reference to both this modern industry and the traditional culture of the Mangbetu, bringing their vibrant fabrics, symbolic objects and daily rituals into confrontation with the digital imagery of the present day. His paintings possess a monumental quality that is both heroic and elegiac, with a striking and sophisticated interplay of intensity and emptiness, two and three dimensions, and Congolese pattern painted as European drapery. 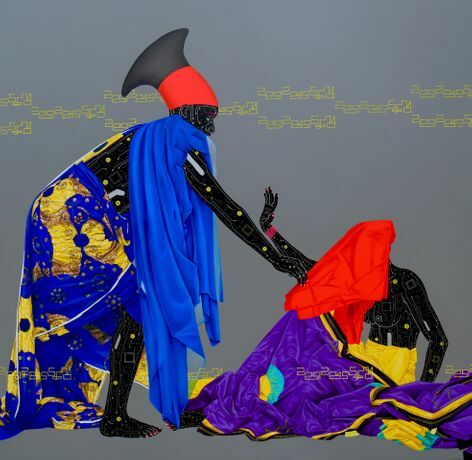 Kamuanga Ilunga’s work has been exhibited across Africa, notably at Dak’Art; Biennale OFF Senegal in 2014, and made its London debut at the Saatchi Gallery’s Panagaea II in 2015. The enormous excitement around the 24-year-old artist at London’s 1:54 Contemporary African Art Fair in 2015 and at New York’s Armory Show in 2016 was compounded by an article in the FT’s How to Spend It, which employed his work ‘Lost’ to represent The Best of New York Armory 2016.